Looks like what I imagine standing inside the CERN Hadron Collider would feel like! Cool image, well done! I've been here! Well executed shot! Great effect. Whoa... this plays with your eyes! At first I didn't see the train, and then I looked closely, and like, whoa! Wow - how fun! It appears to be a tunnel but I would love to know what lights are causing the beautiful colors. 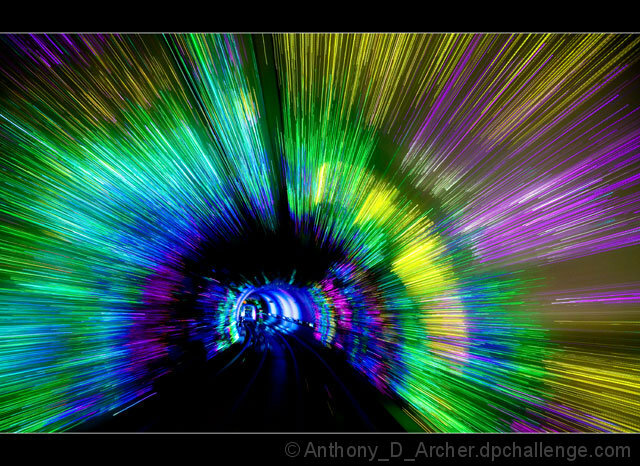 I love the motion and how it draws the eye into the tunnel. Very artistic and unique photo. Great job! Proudly hosted by Sargasso Networks. Current Server Time: 04/25/2019 09:52:55 AM EDT.